An intracellular interaction analysis module for analyzing proteins and their interactions. Proteins are the functional components of many cellular processes and the identification of their physical Protein-Protein Interactions (PPIs) is an area of mature academic research. 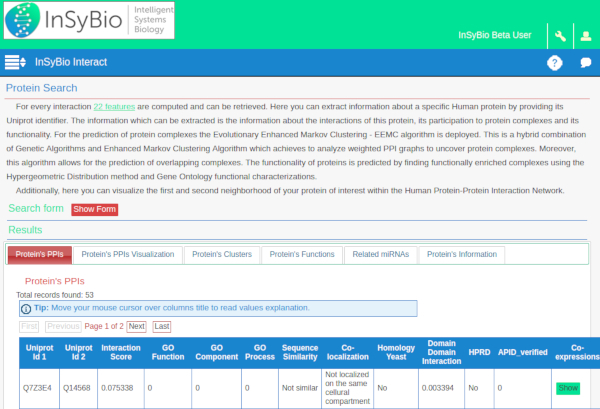 InSyBio Interact enables users to predict a confidence score for each protein pair using using a high performance machine-learning technique. This confidence score indicates the probability of these two proteins interacting. Users are able to tune this confidence score, extract their own datasets, and obtain only positive or negative interactions. Obtain only positive or negative interactions. of the Protein Interaction Networks. The protein interaction networks are clustered using a novel methodology to extract information about the protein complexes which the proteins form to perform specific tasks. These complexes and the overall PPI networks may be visualized using an interactive visualization module.